The British Labour Party is currently leading the Tories in the latest YouGov opinion polls (February 19-20, Tories 40 per cent (and declining), Labour 42 per cent (and rising). They should be further in front, given the disarray of the Conservatives as they try to negotiate within their own party something remotely acceptable about Brexit. When there is this degree of political capital available, in this case for the Labour Party, a party should use it to redefine policy agendas that have gone awry. To build a narrative that will advance their cause for the future decades. British Labour has a chance to break out of its recent Blairite neoliberal past and present a truly progressive manifesto to the British people that will force the Tories to move closer to the centre and squeeze the extreme right-wing elements. In part, under Jeremy Corbyn and John McDonnell, Labour is making progressive noises on a number of fronts. But ultimately, where it really matters – the macroeconomic narrative – they are remaining firmly neoliberal and this will blight their chances of pursuing a truly progressive agenda. One of the glaring mistakes the Labour Party has made is to accept advice from neoliberal economists (so-called New Keynesians) who have instilled in them a need for fiscal rules. This is a three-part analysis of the sort of advice that Jeremy Corbyn and John McDonnell are getting and why they should ignore it. I have split it into two parts because it is long and quite involved at times. I have written about fiscal rules in the past. There is only one fiscal rule that a progressive government should adhere too and I outlined that in this blog post – The full employment fiscal deficit condition (April 13, 2011). See also the suite of blog posts – Fiscal sustainability 101 – Part 1 – Fiscal sustainability 101 – Part 2 – Fiscal sustainability 101 – Part 3 – to learn how Modern Monetary Theory (MMT) constructs the concept of fiscal sustainability. The discussion in those blog posts rejects fiscal rules that are defined exclusively in terms of financial ratios – the type that the neoliberals use to reduce the scope of government and bias policy towards austerity and elevated levels of labour underutilisation. I wrote about the madness in the British Labour Party signing up to neoliberal ‘fiscal rules’ in this blog post – British Labour Party is mad to sign up to the ‘Charter of Budget Responsibility’ (September 28, 2015). One discussion paper that seems to have influenced the Shadow Chancellor in entering these type of neoliberal agreements was published on May 20, 2014 as Discussion Paper No. 429 from the National Institute of Economic and Social Research. I have noticed that SWL seems to get involved with vituperative exchanges with Twitter participants who challenge him on matters relating to Modern Monetary Theory (MMT). He seems to think it is smart to label people, who refuse to accept his New Keynesian blather on Twitter, as being plain dumb. SWL was a member of Labour’s economic advisory committee that John McDonnell formed after becoming the Shadow Chancellor. He later fell out with Corbyn it seems and urged the Party to dump Corbyn as leader and install Owen Smith instead. Well that prediction might still be relevant in 2020, but the last national election outcome, where Corbyn went close (even with many of the Blairites in his own party whiteanting him) suggested that SWL hasn’t much grip on reality. Portes was moved on as Director of the NIESR before his contract was up in 2015. The Sky News article (October 6, 2015) – Why Jonathan Portes left NIESR – claims he was terminated as Director of the NIESR because he was a poor manager and oversaw a deteriorating financial position of the organisation. In their discussion of issues that arise in the design of fiscal rules, Portes and SWL fail to mention the concept of full employment in the NIESR article. Their discussion is pitched entirely in terms of ‘financial ratios’. It is hard to see that the general public will be enamoured with a government that delivers a target fiscal deficit (for example) but at the expense of elevated levels of unemployment and poverty. Fiscal policy has to relate to things that matter. The belief (assertion) that by running fiscal surpluses or getting public debt below some threshold will automatically deliver prosperity (jobs for all, growing real wages, first-class public services, etc) is one of the greatest con jobs that mainstream economists have foisted upon us. Fiscal policy has to relate to targets that matter like jobs, wages growth, and the like. Depending on what the external and the private domestic sectors are doing (with respect to spending and saving), a fiscal deficit of 10 per cent of GDP might be appropriate just as a fiscal deficit of 2 per cent, or even a fiscal surplus of 4 per cent. Context matters not some particular ratio. As an aside the NIESR was a foremost Keynesian research group after being founded in 1938, as the academy was embracing the rejection of neoclassical thinking (which has morphed into the modern day neoliberalism) and recognising the positive role that government fiscal policy could play. Its capacity to engage in quantitative research to support policy was valuable. In more recent times, it has declined and is part of the neoliberal misinformation machine. The Keynesian roots has become New Keynesian, which eliminates all the meaningful insights of the original. I have been asked by a lot of people to comment on the NIESR paper (cited above) and I have been reluctant to do so, given how flawed it is. But given it has been so influential in framing the way in which the British Labour Party hierarchy thinks about macroeconomics, I have decided to consider it. It is hard to discuss the paper though in non-technical terms – accessible to my broad readership, given the way it is framed. So at times, the three-part series will disappear into jargon. Not much though. I am trying to bring the message as fairly and simply as I can, so as to demonstrate the stupidity of the analysis but not be unfair (misrepresent) the authors. Generally, the NIESR paper falls into the realm of what I call fake knowledge. The simple response is that it spends several pages outlining the theory of optimal debt and fiscal policy then admits such a theory is “undeveloped”. Not to be discouraged by the inability of the ‘optimal theory’ to say anything definitive about the real world, the authors, then proceed to draw conclusions from the theory anyway, which just amount to standard assertions. Wren-Lewis just should stick to Twitter. He seems to like that. It would save us the time reading the other stuff. In effect, the substantive conclusions from the paper have no basis in theory and could have been tweets. The motivation of the authors is to discuss what might be a “simple rule to guide fiscal policymakers”. They point out that central bankers have used the “Taylor rule for monetary policy”, which is a simplification in itself. But I won’t get bogged down in discussing whether decision-making in central banks has or had become so mechanistic. It has not been but that is another story. Mainstream monetary economists certainly teach students that central banks operate in the mechanistic way described by the Taylor rule, which is just a formula the textbooks claim is used to set interest rates. But then these characters also teach students that central banks can control the money supply, that the money multiplier is responsible for determining how the monetary base scales up into the broad money supply, that expanding bank reserves will allow banks to make loans more easily, that expanding bank reserves is inflationary and all the rest of the litany of lies. None of the central propositions that are taught to macroeconomics students in this regard are valid. They are fake knowledge – a stylised world of how these neoliberal economists want to imagine the real world works because they can then derive their desired policy regimes from it. The real world – central banks and commercial banks – do not function in this way. Some of these monetary myths spill over into the analysis presented by Portes and SWL, which I will indicate presently. Their motivation is to “search for such a rule” that might apply to fiscal policy, although they conclude at the outset that “one single simple rule to guide fiscal policy may never be found”. 1. “basic theory suggests that fiscal policy actions should be very different when monetary policy is constrained in a fundamental way”. They cite the case of the so-called “zero lower bound” as constraining fiscal policy options. In fact, no such constraint exists. Whether interest rates are zero or something else, the currency-issuing government has the same capacities and options. There is no evidence that monetary policy suddenly becomes effective as a counter-stabilising tool at some positive target policy rate and should be preferred over fiscal policy. The authors also suggest that the exchange rate regime will constrain fiscal policy. This is correct, which is why Modern Monetary Theory (MMT) theorists argue against pegged arrangements – they reduce the sovereignty of the government. If a nation pegs its exchange rate then it strictly loses its sovereignty because the central bank has to conduct monetary policy with a view of stabilising the external value of the currency, which then limits the flexibility of domestic policy. That is why the Bretton Woods fixed exchange rate system collapsed in August 1971. It biased nations running external deficits towards elevated levels of unemployment and crippling interest rates, which proved to be politically unsustainable. Here we get the bizarre notion introduced that theory describes an “optimal policy” but that “there may be a trade-off between rules that mimic optimal policy, and rules that are effective in countering deficit bias” because politicians cannot be trusted to exhibit the ‘correct’ degree of austerity and instead become drunk on net spending (their concept of a “deficit bias”). These ‘deficit drunk’ governments are labelled “non benevolent” because they allegedly trash the future of our children. Heard that one before? Sure you have, along with ‘governments running out of money’, ‘tipping points’, etc. To solve the problem of these ‘deficit drunk’ governments, Portes and SWL think technocratic constraints are needed to prevent the governments responding to the desires of the population as represented by their mandate. Of course, imposing technocratic constraints against a democratically elected government has become a major characteristic of the neoliberal era. Portes and SWL fit right in with that trend. All this is part of the ‘depoliticisation’ trend that has seen elected governments shed political responsibility for key decisions that have damaged the well-being of the vast majority of people in their nations by appealing to ‘external’ authorities. The ‘we had to do it, we had no choice’ ruse, the ‘Dennis Healey, we had to borrow from the IMF because we were running out of money’ ruse, the ‘we need to outsource fiscal policy to economic experts because politicians just want votes’ ruse. These external authorities might be so-called independent central banks (even though they are not independent – see later), the IMF, and fiscal boards (such as the Office of Budget Responsibility in the UK). We examine that trend in our new book – Reclaiming the State: A Progressive Vision of Sovereignty for a Post-Neoliberal World (Pluto Books, September 2017). Further, the term ‘deficit bias’ is loaded. Portes and SWL would claim that continuous fiscal deficits illustrate this bias. However, in most nations, such continuity is necessary to support the saving desires of the non-government sector, while sustaining full employment. There would be no ‘bias’ there. Just responsible fiscal practice. I will discuss that in more detail presently. Refer back to the blog post – The full employment fiscal deficit condition. Further, the so-called New Keynesian ‘optimum’ is unlikely to have any relevance for the well-being of the population, and, in particular, the most disadvantaged citizens in society. The standard New Keynesian ‘model’ didn’t even have unemployment in it. Please read my blog post – Mainstream macroeconomic fads – just a waste of time (September 18, 2009) – for more discussion on this point. If you understand the dominant New Keynesian framework, which has become the basis for a new consensus emerging among orthodox macroeconomists like Portes and SWL, then you will know the following. 1. The basic New Keynesian approach has three equations – which in themselves are problematic (see previously cited blog for more detail). They claim authority based on the micro-foundations that are alleged to represent rigourous optimising behaviour by all agents (people, firms, etc) captured by the model structure. 2. Because the ‘optimal’ theory, specified in the basic structure (Calvo pricing, rational expectations, intertemporal utility maximising behaviour by consumers, who face a trade-off between consumption and leisure, etc) cannot say anything much about real world data, the empirical models are modified (adjustment lags are added, etc). As a result ad hocery enters the applied domain where substantive results that are meant to apply to policy are generated. 3. But it is virtually impossible to builds these ‘modifications’ into their theoretical models from the first principles (intertermporal optimisation, etc) that they start with. 4. Which means that like most of the mainstream body of theory the claim to micro-founded ‘rigour’ is unsustainable once they respond to real world anomalies (of their theory) with ad hoc (non rigourous) tack ons. 5. The results they end up producing in empirical papers are not ‘derivable’ from first-order, microfounded principles at all. Their claim to theoretical rigour fails, At the end of the process there is no rigour at all. It becomes a false authority that they hide behind to justify their assertions. The Portes-SWL paper is no exception. Further, the ‘Great Moderation’ was considered a move closer to the New Keynesian utopia (‘the business cycle’ was declared ‘dead’, for example). Yet all we witnessed during this period in the 1990s and up to the onset of the GFC, was the redistribution of national income to capital as real wages failed to keep pace with productivity growth, increased inequality and private debt, elevated levels of unemployment, the emergence of underemployment, and the dynamics being put in place which manifested as the GFC. And, the burden of the GFC was not borne by the banksters or the top-end-of-town. Their criminality largely escaped unscathed while millions of workers lost their jobs and many became impoverished. The belief that one can derive ‘optimal’ rules from a New Keynesian model that have any relevance to people or the world we live in is another characteristic of the neoliberal era. My profession basically went from bad to worse over this period. Please read my blog posts – Garbage In, Garbage Out (GIGO) (October 7, 2009) and OECD – GIGO Part 2 (July 27, 2010) and A continuum of infinitely lived agents normalized to one – GIGO Part 3 (February 6, 2012) – for more discussion on this point if you are interested. However, none of that reality discourages Portes and SWL, who begin their analytical section by outlining this so-called New Keynesian “Optimal debt policy”. 1. taxes impose costs in terms of social welfare because they “are distortionary”. This means that they prevent people from making ‘optimal’ decisions. The microeconomic theory these authors rely on claims that tax distortions include workers not working hard enough because the imposition of taxes create incentives for them to take more leisure. This is a body of theory that also says unemployment is a choice workers make when the real wage (after tax) is so high that they prefer to take leisure instead of working. No problem, the workers are ‘optimising real income’ by being unemployed – leisure is part of this ‘real’ income measure in these models. If you thought that sounded like nonsense then you are right. Quits do not behave countercyclically, which would be required if unemployment was a choice made by workers. Further, the research evidence suggests that the imposition of taxes does not alter the desire of workers to offer hours off work in any significant way. For a start, most workers do not have continuous (hours) choices available to them. They work 40 hours (or whatever) or not at all. Further what about carbon taxes and other similar taxes, which, even in the mainstream theory, correct market failure and enhance efficiency? Which is an absolute lie in terms of the intrinsic nature of a monetary system where the national government issues its own currency. It is a convenient lie because they rely on it to derive the results in their paper. They also need this ‘optimality’ smokescreen to persuade politicians to take the results seriously as if their ‘assumptions’ are, in reality, natural constraints on governments. The lie also implicitly biases the reader to accepting the ‘lower’ taxes are better than higher taxes, a proposition that depends on other assumptions they choose not to disclose because they are smart enough to know that that would push the discussion into the ideological domain and these characters want us to pretend that economics is ‘value free’ and everything they are writing is derivable from ‘optimal’ theory. One of the first lectures an economics student is forced to endure contains assertions that there is a divide between what mainstream economists call ‘positive’ economics (value free) and ‘normative’ statements (value laden). Mainstream theory holds itself out as being ‘positive’ and then blames dysfunctional outcomes on the ‘normative’ interventions of policy makers, who choose to depart from the ‘optimal’ world of positive economics. If you thought this was an elaborate joke played on the students then you would be correct. And in terms of the above, the correct statement would be that governments impose voluntary constraints on themselves – engineered by conservative ideologues. They have created accounting processes that ‘account’ for tax receipts into, say Account A, which they then ‘account’ for their spending from. A sort of administrative fiction to give the impression that the tax receipts provide the wherewithal for government spending. But anyone knows that these institutional practices can be altered by the government whenever they choose (unless they are embedded in constitutions and then it takes more time). The reality is that unlike the assertion of Portes and SWL (which drive their overall results), governments do not need taxes to pay for government spending. That is an ideological constraint designed to limit spending. Intrinsically, a sovereign government is never revenue constrained because it is the monopoly issuer of the currency. Modern Monetary Theory (MMT) tells us that taxation serves to create real resource space (idle non-government productive resources), which governments can then bring into productive use to fulfill its elected socio-economic mandate. That taxation reduces the inflation risk of such spending but does not ‘fund’ it. The fact is that a currency-issuing government can purchase anything that is for sale in its own currency including all idle labour. MMT also recognises other roles for taxation – such as taxes on bads designed to divert consumers or producers away from these goods and services. But that is another story. Further, a government never needs to issue debt to ‘fund’ deficits. That is another institutional practice that carries over from the fixed-exchange rate, gold standard days. It is no longer necessary and an understanding of MMT leads one to realise it is largely an exercise in the provision of corporate welfare that should be abandoned. Please read the following introductory suite of blogs – Deficit spending 101 – Part 1 – Deficit spending 101 – Part 2 – Deficit spending 101 – Part 3 – for basic Modern Monetary Theory (MMT) concepts. The point is that if you build ‘economic models’ based on these voluntary constraints, as if they are intrinsic constraints, then the results turn out radically different to the outcomes of an analytical exercise where you assume, correctly, that the government does not need taxes to ‘fund’ spending or to issue debt to fund deficits. Then the mainstream results largely collapse. I suspect the authors in question implicitly know this. If they don’t then you can draw your own conclusions. In Part 2 we will consider some of the mathematical musings that Portes and SWL proffer in the NIESR paper to convince their readers that they are onto something that matters. Anyone who knows about this stuff will not be convinced. It is voodoo sort of stuff. And after reading my blog posts, those who didn’t previously know will be clearer. But please don’t have a Twitter war with the SWL. It is just a waste of your time really. I am giving a talk in Helsinki today – Tuesday, February 27 (one of five over the next two weeks) on the topic Think our Governments can no longer control capitalism? Think again!. The first in the series of five lectures which forms part of the MA course “GPC-E313, From Modern Money Theory to Global Political Economy and Revival of Classical Political Economy”. All lectures are open to the general public. Please contact Heikki Patomäki for details. 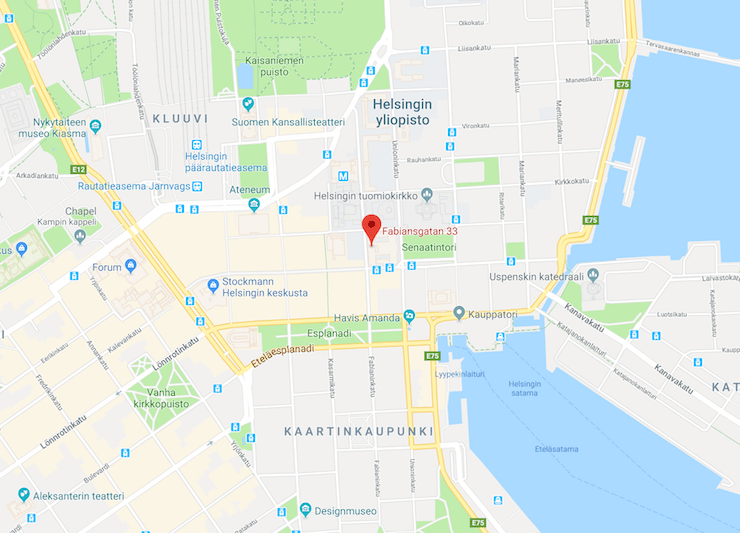 The first lecture will start at 16:15 and will be held in the main building of the University of Helsinki, Lecture Hall 5 (Fabianinkatu 33, 00170 Helsinki, Finland). The title of the first lecture is borrowed (modified) from the UK Guardian article (December 14, 2017) by Larry Elliot – Think our governments can no longer control capitalism? You’ve been duped – which reviewed my new book with Thomas Fazi (published September 20, 2017) – Reclaiming the State: A Progressive Vision of Sovereignty for a Post-Neoliberal World. The lecture will rehearse some of the major themes in that book and more generally set the stage for the next four lectures at the University, which will be of a more technical nature, building the principles of Modern Monetary Theory (MMT) in a rather academic manner, although the program is within political science rather than the mainstream economics discipline. The final lectures will include an excursion into the history of economic thought, the development of the MMT analysis on unemployment and inflation (buffer stocks and UBI) and the Eurozone. Some of this material will seep into the curriculum that will be available later in 2018 via the MMT University initiative. Amazing to read that these bozos think that ‘deficit drunk’ governments are “non benevolent”. We should all understand that driving a neo-liberal agenda is seriously, even criminally “non benevolent”. The damage done to society by this regimen is just ruinous. So many have had to bear unemployment and straitened circumstances visited upon them by the incompetent and venal politicians that infest parliaments all over the world. I really hope against hope that Corbyn at least gets to understand your message and gives hope of worthwhile change. I do not understand how progressives haven’t picked up Language matters! You can not have change when you do the same thing! Monetarily sovereign, governments spend so we can earn and government deficit is an injection to support employment (in regards to a JG) a surplus in a contraction (it takes out more than goes in) A simple diagram with a focus on what happens in the private domestic sector is all that is needed. That’s the political point. Democracies cannot manage themselves, so they should be reduced to the status of toddlers left with the choice between red or blue low sugar fruit cordial. Because its good for them. The adult technocrats then make sure everything is ok – for the new aristocracy. In fairness to Prof Wren-Lewis, he has at least occasionally attempted to ‘clarify’ MMT issues via his blog since 2014. However, I’m not sure that he’s ever properly engaged with many of the issues you raised here – despite them being mentioned repeatedly in the comments to his pieces. He’s still too wedded to the views of the mainstream and defending them against the (thoroughly deserved) post-GFC criticism. I’d say that it’s highly unlikely that he passed any of this on with his advice to John MacDonnel though. Adrian, it is unlikely SWL told McDonnell anything, as the committee never really met and Piketty never attended any meetings at all. The committee was disbanded soon after it was set up. I don’t think you need to be ‘fair’ to SWL as he is not really fair to his critics. I don’t interpret his blog posts on MMT the way you do. I don’t think he attempted to clarify anything. Xenji, a saying attributed to Einstein is that doing the same thing and expectind a different result is the definition of insanity. Neil, I heard a similar story about Portes’s ‘resignation’ as Bill did. It seemed to me that the Spectator story was a delivery of the announcement with a caveat that would not necessarily be clear to the uninitiated. Wren-Lewis was actually quite complimentary about MMT in a blog post roughly three months ago. I’ve just done some Googling to try to find it, and can’t. Post video of the lecture, please! As someone older in the tooth than most, I was immediately receptive to MMT arguments, because I was prepared years ago by a book called “Money: the decisive factor”by D. Allhusen and E.Holloway publ 1959 in London (which I bought in a shop selling secondhand [junk] furniture) in the 70’s. This was very straightforward : “All that is necessary is to restore the Prerogative of Issue to the State,to which it rightly belongs and from which it should never have been removed. Looked at objectively, the present position appears fantastic. We have allowed private institutions to usurp the right to issue our money and make a profit out of it. In addition to being the proper authority to issue money ,it happens that the State is the only one in a position to do it in the right way: that is by spending. For it is essential that money should enter the economy free of interest charges “etc. Two thoughts: somebody should prepare a similar plain English clarifier now; it is alarming that such a punchy book could be swallowed up in the same-old-same old orthodox lunacy and sink without trace or influence. There are clearly people at work restricting the range of available economic knowledge. Thanks for the heads up on the book. Randall Wray’s primer “Modern Money Theory” is an easy read. It gets to the point clearly and simply. So does “Reclaiming The State”. What is the best evidence to convince people that national governments of nations with sovereign currencies fund all expenditure with currency issued by the central bank? Andreas Bimba, in my opinion, the best historical proof of how national governments that issue a currency actually spend in their currency is provided during periods of large scale war. Mostly, even if a currency hadn’t been ‘sovereign’ beforehand (like the country had been on a gold standard), the currency will become ‘sovereign’ (as in fiat, no longer guaranteed to be exchangeable to another currency or commodity) at least for domestic purchases. Even if the country has a nominally independent central bank, it will be directed to support the war effort in all of its actions- there will be no talk of the supposedly ‘independent central bank’. And there won’t be discussion about whether the government has the tax revenues available to purchase guns or bombs- if they are for sale in the currency, they will be purchased. Governments have always known that commodity money inhibits their capacity to spend because commodity money tied to something like gold is essentially a debt instrument payable at call. The sad reality is that the political will need to exploit a fiat currency to sustain government spending only ever exists under wartime conditions. WWI and WWII being cases in point. Did you know the British financed most of the Industrial Revolution with a fiat currency? Between 1797 and 1821 currency issued by the Bank of England was irredeemable because of the risk that a run on the Bank would have bankrupted it. This period also coincided with one of the most prolonged periods of sustained government expenditure in British history because Britain was at war with post-revolutionary France? The Bank of England was also extremely profligate with its irredeemable banknotes during the suspension. It adopted a policy known as the ‘Real Bills Doctrine.’ In essence the Bank lent in limitless amounts at interest rates of 5% or less (there were usury laws in operation at the time) to anyone who could demonstrate a legitimate need for them. The bank discounted any bill of exchange presented to it that was acquired in the course of business and could offer good security. Modern economic growth did not begin a classical, neoclassical or a neoliberal paradise. Quite the opposite actually. Government spending and an abundance of cheap fiat money acquired on capiatla markets subject to interest rate control kept a population that was growing rapidly fully employed. Naturally the dreaded David Ricardo hated it. His latest blog is a little more disparaging. Your suggestion that only the state should issue / print money (i.e. that private banks should be barred from that activity) has been around for centuries and has many supporters today. A “state money only” system is normally called “full reserve” banking or “100% reserve” banking. Supporters of that idea include Lawrence Kotlikoff, Milton Friedman, Matthew Klein, The New Economics Foundation, and Irving Fisher. Plus the two most recent articles by me at the Seeking Alpha site are on that topic. Thanks Jerry and Philip especially about the period of the industrial revolution. In times of war the central banks have issued huge sums to fund wartime mobilisation but MMT proponents argue that all national government spending (those with a sovereign currency) is met with issued money since fiat currencies were introduced. How can I demonstrate this fact to those that are sceptical about MMT? I’m not trying to hijack the thread but I think this question is important for winning over supporters. The problem with using British wartime experience as proof that MMT works is the fact that conservative Treasury officials were in place during most conflicts. I know Britain borrowed to finance its expenditure during the Napoleonic Wars, during WWI and WWII. On each occasion, the intention was to return the pound to convertibility as soon as possible after the war. Had these governments exploited their fiat currency to finance their spending, therefore, the currency issued would have turned into debt eventually. I don’t imagine the privately owned Bank of England would have looked upon the prospect of having to redeem such a large amount of currency on day with a great deal of relish. Classical and neoclassical thinking prevailed on each occasion. The decision was taken to finance the war effort with debts incurred by the Treasury rather than banknotes issued by the Bank of England. I don’t think there is a truly perfect historical fit for what MMT proposes. Andreas, I think that Bill Mitchell has done a pretty good job of explaining how it works- he managed to convince me at least and I was pretty skeptical at first. And it only took reading maybe a million of the many millions of words he has written here at billy blog. I don’t know if anyone can quickly overcome people’s very understandable inclination to think that how the currency issuer operates is similar to how a household or business must operate in order to spend in a currency. If pointing out how national governments have spent in the past under total war conditions doesn’t convince the skeptics, there is the logical point that in order to collect tax in a currency, that currency will have necessarily have to been distributed in some way (spent, in other words, by the government) before it can possibly be collected in tax. So in terms of the national currency, what comes first- either the government spending or the tax collections is not as difficult a puzzle as what came first- the chicken or the egg. Thanks again Philip and Jerry. Bill often uses the example of Japan as well. For most of their postwar period Japan has had considerable fiscal deficits and close to full employment. Their national government debt is therefore enormous yet they have no intention of paying it back and the Bank of Japan is able to set the government bond interest rate. Japan is proof that MMT core principles are sound. The Chinese government has a fiscal deficit of 15% according to Steve Keen and has very high economic growth and rising material living standards and may be applying MMT principles as I can’t ever see Chinese government debt being repaid. However none of these examples are simple proofs that central bank currency issuence funds national government spending. The Chinese government has a fiscal deficit of 15% according to Steve Keen and has very high economic growth and rising material living standards and may be applying MMT principles as I can’t ever see Chinese government debt being repaid. Interesting that, and ironic, considering the alarmists on Youtube & elsewhere claiming that the USA is in hock to China on account of the latter’s US Treasury holdings. However none of these examples are simple proofs that central bank currency issuence funds national government spending. It would be interesting if Japan and China were running high deficits without issuing any bonds. Of course, it may turn out that their deficit is not fully covered, or “funded” by bond-issuance, and thus are to some extent (grits teeth) “printing money” (ungrit). After reading the linked article below I can answer my own question – what is a simple proof that central bank currency issuence funds national government spending? Although not really a convincing proof, Warren Mosler apparantly determined this from studying how the US FED, Treasury and federal government interacted. Wren-Lewis says on October 2, 2017, that most economists seem to understand that these assertions are factually correct at least some of the time. But the real question is how can’t they see (or maybe just admit) that Bill’s statements here are factually correct all of the time- while pointing out that at some times, while the ability is always there, that does not mean it is always advisable to exercise it. It doesn’t seem that difficult to me. Simon Wren-Lewis has had some reasonably positive commentary on MMT over the last few months. For example, “Some Thoughts about the Job Guarantee” posted November 18, 2017 and “Why is MMT so popular?” from October 2, 2017.